The MATTER-project, a two-year Catalisti-ICON project (2018-2019), wants to evaluate the recycling of mixed (post-consumer) plastic waste streams and to use the generated data to develop a decision supporting framework. The MATTER-project is a cooperation between four companies (Indaver, Borealis, Bulk.ID and ECO-oh! ), Ghent University (4 research groups) and University of Antwerp (2 research groups). Organizations such Fost+, Plarebel and OVAM will be closely involved in the project execution. Within the MATTER-project, technical and market-based criteria will be developed to support an optimal plastic waste management system. More specifically, the project will focus on the P+ fraction (all plastics packaging waste) of the extended P+MD collection and recycling scheme. Partners from across the whole value chain are included in the project consortium: separation and pretreatment (Indaver and Bulk.ID), mechanical recycling (Borealis and ECO-oh!) and thermochemical recycling (Indaver and Borealis). Sustainability analyses will enable the development of a decision-supporting framework. By generating general knowledge on the recycling of mixed plastic waste and specific knowledge on the optimization of the P+MD recycling scheme, the valorization of the project is twofold. On short-term, the collection of an extra 50.000-150.000 tons of mixed plastic waste is expected for the P+MD scheme, most of which are packaging materials for which not always alternatives to incineration are available today. 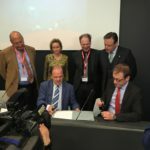 The results of the MATTER-project will therefore be essential for the development of sustainable recycling solutions for this significant amount of waste. In the longer run, the general recycling knowledge can result in extra activities on the processing of other plastic waste fractions.